Welcome back to the second half of my interview with Spirit President and CEO Bob Fornaro. (If you missed the first half, here it is.) When we left off, Bob was talking about how the big guys are trying to be everything to everyone, and how that’s not an easy thing to do. We pick things back up with Bob talking about how Spirit is focused. that may be on $70,000 or $80,000 opportunities. Not tens of millions. They may have one consulting account, and if they can manage their time and expense there can be some real savings. And so that’s ultimately our target market, so it does simplify how you approach things. Like I said, when you try to complicate it and go for that customer and all these various customers, it becomes fairly difficult to manage at the end of the day. Generally speaking from a price-matching perspective, it’s hard to control. You can’t always control which person is getting the fare…. The key is, again, what we actually saw after a year of our operational improvement program, we saw revenue improvement. Really did. And we saw a deterioration when we had some of the [operational] issues in May, but I was surprised. Cranky: You were surprised how quickly it happened or you were surprised there was revenue improvement at all? Cranky: Just by running on time. Bob: Yeah, a lot of people thought running better meant spending money hand over first, but you go back… our cost of failure is fairly high. We saw some improvement in the marketplace; 6, 8 months of improvements in doing things. And once you have fewer service failures, then you can actually do the right thing because there’s fewer people to serve. So much of the stuff we’re doing, they weren’t money issues. They were simple courtesy issues, response issues. For us, we made our problem become the customer’s problem. And at the end of the day it’s not a good place to be in a business that’s pretty competitive…. I’ve been on different sides of this. Eventually things have a tendency to sort each other out, because I don’t underestimate anybody and I think it would be a mistake for someone to underestimate us. Cranky: People complain about them but not about being on-time. But none of the carriers developed that way in the US initially. If you look at Spirit’s origin as [an ultra low cost carrier] or you look at Allegiant, it was always a straight “look at our costs” and the operational integrity wasn’t there. Do you have a sense of why it developed that way? Bob: In 1999 my first year [at AirTran], our operation was horrible. Our on-time performance was about 60 percent. Everything was wrong. I think a lot of times in the US, low cost and cheap… you know you held back on things. Shoestring budgets. A lot of times, people… it’s just a mindset. You have to spend your money wisely. That’s one thing I learned in my last job. Most of the things we learned at AirTran, it wasn’t about money. It was about learning how to manage a hub, which we were number one on bags. We had half our flights in Atlanta and 65 percent connecting. We had the best baggage numbers in the business. It wasn’t about money, it was about organization. We just basically made a decision on our own. It was a reputational credibility thing. We were embarrassed. We knew eventually we’d be a [operational statistics] reporting carrier [to the DOT] in ’02 or ’03. When we got to ’03, we didn’t like where we were. It helps us in the marketplace as well, because we became very, very consistent. My expectations are if there’s benefit on the upside I’ll take it. But I know you can remove downside and book-away and all those things. But word travels fast if you have a bad experience people want to know about it. As you know, people talk more about their travel, both good and bad, versus what their accountant does. It just happens to be more topical. It’s more of a shared experience. Word-of-mouth is pretty important and I also think if you work in the company, who would you rather work for? A company that runs well? Our largest workgroups, between pilots and flight attendants we have 4,000 people. If you’re running well, the job is easier. Bob: Absolutely. It’s fairly simple, but if you look at even the legacy carriers a decade ago. Sixty percent of the capacity was in bankruptcy. They were taking everything away. When you’re failing and you’re scared, you do a lot of things for the wrong reason. And what you’re seeing now all around the industry is saying “you know what? We did that. I guess I understand why, but we don’t want to do that any more and we don’t have to do that anymore.” The point is those guys hit bottom as well. If you go back 5 or 6 years ago, the big guys were always in the bottom, even with the networks they have. The people were different and the engagement was different. I’ve kind of watched it myself even in Ft Lauderdale where we’re bigger. We had a good year, there’s upswing, you could see it and feel it. All the experiences were generally positive. If we lost your bag, we were replacing it on the spot. Rather than creating this massive effort to not deal with the problem. The people knew what to do. Cranky: They just needed to get permission and tools. Bob: Yes, absolutely. So [VP of Consumer Marketing] Bobby Schroeter manages this area. He knew what to do. He’s always known what to do, but he just needed the license to do it. And the biggest debate “was how fast do we go?” As he would say, if about 70 percent of the things we deal with are either tied to a very late flight or cancellation, that’s the most important. The complaints aren’t that we charge for water. Cranky: Sure, I mean I’m sure you get tweets about that, but those aren’t the DOT complaints. Bob: I ask people “What are the things we’re doing that really don’t save us anything fundamentally?” I keep waiting for the head of the flight attendants to say “put water back on the airplane.” No-one wants to do it now because it’s gotten to the point where… why bring it up? We never hear about it. To me, those aren’t real costs. Cost are big costs. Utilization is either a cost or an opportunity…. That’s a really big driver. Turning airplanes is a big driver. Or maintenance or cancellations, that’s where the money needs to go. If those things are right, the other stuff doesn’t really matter. Cranky: So how you decide where to draw the line on some of these things? For example, and I don’t know if this is something you’re doing today or not, but if you have one flight a day in a market and that cancels, do you say “you can go on the next Spirit flight or get a refund?” Or do you look at other airlines? Bob: We will [look at other airlines] if it’s our fault. We’ll try to give the person an opportunity on us within 24 hours. Otherwise we’ll buy them a ticket. Cranky: So that’s what I’m talking about. How do you make the decision on where to draw the line? At some point that can get very expensive. Obviously not as expensive if you’re running a good operation. But drawing that line between [ultra low cost carrier] and full service, how do you decide? Because what everyone wants is to pay nothing and get everything and that’s not possible. Bob: So we’ll draw the line on something that’s controllable or not… From that point, we tell the truth. We don’t try to play games…. It is a low fare, but I have to say, where we really are moving is generally “value.” We’re not the only ones, but there is a difference between low-fare and being cheap. Because the planes are new and we can get people a good experience if [employees] are friendly. I have no intention of adjusting pitch. I think our 28 [inches] is just as good as the 30s [inches] out there anyway. And anybody can debate that, but I watch people on our airplanes. People have heard our reputation, but they get on and it’s a brand-spanking new airplane. It’s not what they expected. Like I said, we more focused in the past on the cheap than the value, and they can be two dramatically different things. Cranky: [I’ve written that] one of the best values on travel domestically is the Big Front Seat. Do you think it’s paying for itself by having two seats instead of three? Bob: Eventually we’ll start selling it at the gate. We already sell it on aircraft if it’s open. It will. We do ok there. I would have thought we’d have done better, but there’s a different customer that’s more likely to upgrade at different times. I think that should run 100 percent [full]. There’s an opportunity there. It is a great deal. I think it is the best deal in the business. To get a big seat. To me, the way I view domestic travel, I want my level of comfort and I want to be left alone. If I’m doing a Europe personal trip, I’m traveling a little bit differently. That’s actually an opportunity for us. 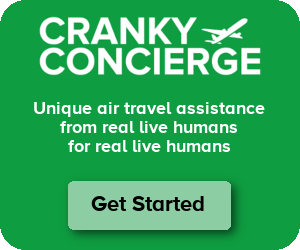 Cranky: It sounds like there’s an opportunity in how you manage the revenue on some of these ancillary services [in general]. Bob: And to do some of these things dynamically will help us. A lot of the things we’re talking about, I can’t say these are all breakthroughs. They are things that we’re kind of rushing out. We had a false sense of security a couple years ago. We operated in this bubble and maybe we thought it would never change but it all changed very fast. We’re putting stuff into place that you would have liked to have had in place over the last couple of years. And that finally ends my coverage of this year’s Boyd Conference. Only 11 months until the next one…. If you missed the first part of the interview, you can find it here. Was that conversation before they cancelled thousands of flights because of lack of pilots? of course all of the comments made by Mr. Fornaro have to be taken in the context of an open labor contract for NK’s pilots and the operational problems NK had earlier this year because of it. While NK seems to be managing the operation better now, they are in the same boat in trying to keep existing pilots and recruit new ones as most other carriers that have not signed new, more expensive labor contracts. Oliver – Yes, this was in August. But one issue with pilots does not change the historical record that Ryanair is a stellar operator. Quote: “Because what everyone wants is to pay nothing and get everything and that’s not possible.” -Unquote. This one very profound sentence says everything right there. Everything. Anything else is just irrelevant fluff. I know Boyd was a while ago, but did the whole pilot contract situation come up during your conversation, Cranky? Itami – No, if it did, I would have posted here. Is there any reason why their 28″ pitch on an A320 is just as good as 30-35″ on the same A320 on Delta or United? Yes, I know, 35″ is E+, which makes up a significant proportion of the seats, but even without those 30″ (or 31/32″ on Delta) > 28″. Either my legs fit or they don’t. Agreed. I think Mr. Fornaro might feel differently about the pitch issue if his desk (and all the conference rooms in his office) were restricted to a 28-inch pitch for a week or two. Oliver – Pitch is a really, really bad metric since it doesn’t account for the width or design of the seat. The reality is that a seat with a couple inches less pitch can be better. I can’t vouch for this particular claim entirely since I only flew Spirit once and can’t remember the seats. But it’s definitely possible to take that position. Sure, but I doubt that they have wider seats on their Airbuses than United. Maybe wider than United’s 737 seats since the cabin is narrower on the Boeing (and I think I heard that Delta may have 737-width seats on some former NWA Airbus aircraft). And yes, seating comfort is impacted by other factors (cushioning). But cushioning doesn’t help if I don’t fit. I don’t know what the pitch was, but I recall one flight on an L1011 from SFO to HNL (some Suntrips or Pleasant Hawaiian package deal) where I literally could not sit straight, even without the person in front of me reclining. And I am only 6’1″.